Reading poetry can offer solace, a fresh eye on the world, a renewed love of language. But sharing your discovery with other readers brings another dimension of pleasure – the swell of confidence and enjoyment that comes from a give and take of new ideas, fresh approaches, and discovering poems and poets you’d never otherwise stumble across. The weekend should continue to refresh and inspire your reading once you go home, with the help of a reading diary, your own reading plan for what to explore next, and a session on running your own poetry discussions with friends. Moniack Mhor is within reach of national and international air, rail and bus links at Inverness. If you plan to travel by public transport, the Centre can arrange for you to share a taxi from Inverness with any other participants who may be arriving around the same time. You can arrive between 4-6pm on Friday, and the course will run from 6pm on Friday to 2pm at lunchtime on Sunday. Moniack Mhor Writers’ Centre is comprised of two separate buildings. The house, a cosy converted steading, has 12 rooms, a large, well stocked, farmhouse kitchen and a welcoming, common room with a wood burning stove. There is an induction loop and the main work/living space is wheelchair accessible. The cottage has three rooms; its sitting room contains four networked computers and a printer, and it houses a large fiction library and a large selection of poetry books from the Scottish Poetry Library. The centre can offer a wi-fi internet connection. Full board will be provided, and Centre staff will provide evening meals on the Friday and Saturday nights, breakfast and lunch on Saturday and Sunday, and ensure that tea, coffee and snacks available in the kitchen at any time. We will make every effort to provide for particular dietary needs if you tell us about these in advance. Further information can be found on the Centre website, http://www.moniackmhor.org.uk. Everyone at the library is looking forward to the return of the Bookmarket to our friends and near-neighbours, The Fruitmarket Gallery. 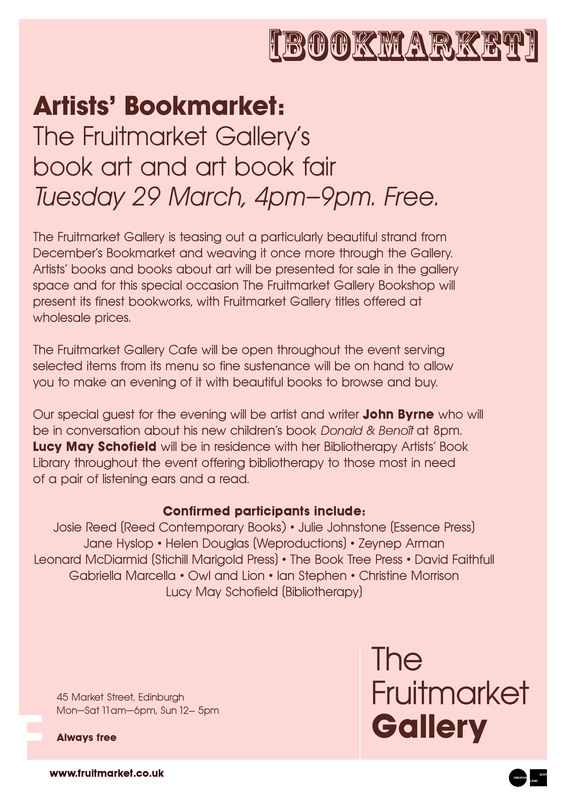 This time the focus will be on Artists’ Books, with a special appearance from John Byrne at 8pm, and Lucy May Schofield will be in residence with her Bibliotherapy Artists’ Book Library. Poet and cultural historian Alistair Findlay has unveiled his tribute to the Edinburgh-Bathgate railway line at a ceremony at Bathgate Station this morning. His 37-line ode – The Railroad’s a-Comin’ – will go on permanent display at the station. 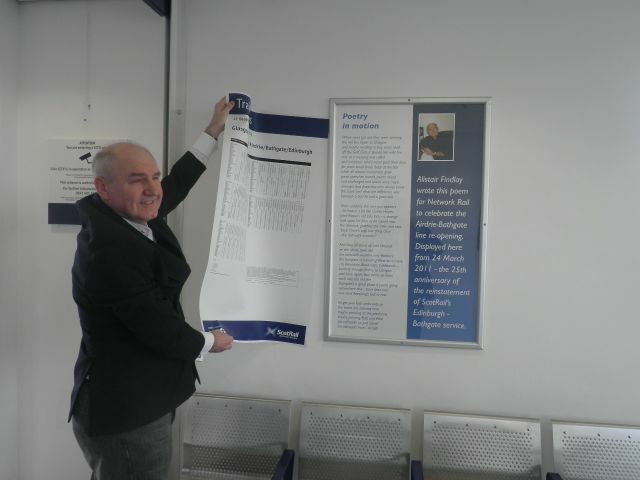 It was commissioned by Network Rail for the celebrations to mark the new Bathgate Station opening in October 18 last year and will be put on display by train operator ScotRail to mark the 25th anniversary of the reopening of the Edinburgh-Bathgate line. The Scottish project will take place from St Andrews Night 2011 to Burns Night 2012 at the National Museum of Scotland, Edinburgh. 26 writers will be asked to write about 26 objects that tell the story of Scottish history and will form a treasure trail through the galleries. It is a tight brief of only 62 words, which will be on display in the Museum and be a focus for events during the exhibition and an online campaign. We are looking for a wide variety of writers from different disciplines to volunteer for this project. They will be required to produce 62 words about the exhibit, a blog piece for use on the 26Treasures website and to take part in events. Please email NMS26T@gmail.com to receive an application form. Applications must be received by 28 April 2011. Our friends at the West Port Book Festival will be holding a fundraising event here at the library on Saturday 26th March to raise funds for the Red Cross International as they work to help survivors of the Japanese tsunami. Mio Shapley will be performing a tea ceremony and telling some Japanese traditional folk stories. Whether you are coming along for the first time, or if you attended Mio’s event at the library in November last year, as part of the Scottish International Storytelling Festival, this is one not to be missed. Doors open at 7.15pm for a 7.30pm start. The organisers recommend booking a free ticket for this part of the evening; email kay@westportbookfestival.org. There will be opportunities to donate throughout the evening. With all proceeds going to the Red Cross International’s Japanese tsunami relief fund, whatever you can afford to give will make a difference. Thursday 3rd March saw the Scottish Poetry Library full of teenagers as the Young Edinburgh Writers (YEW) prepared to launch their book Muffins and Musings. YEW is a group for teenagers across the city, offering them the opportunity to hone their writing skills whilst meeting other young folk who share their enthusiasm for what can sometimes be a very solitary pursuit, particularly in the teenage years. Muffins and Musings was funded by the Young Scot Arts Action fund and is the culmination of over a year’s work, with the group being involved at every stage from writing the content, to choosing the title, designing the cover, deciding on the order of pieces and finally performing it on the night. 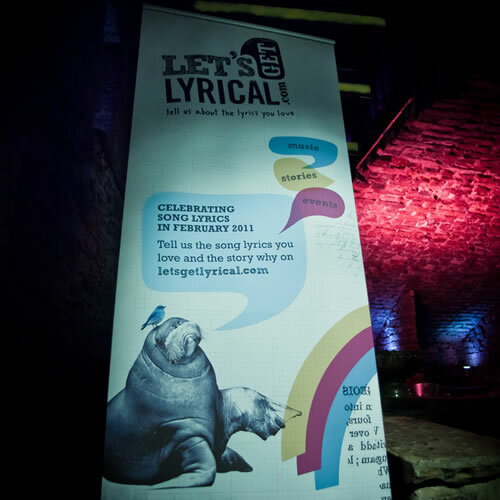 We have had such a lot of fun with our events this month, in league with the Let’s Get Lyrical campaign, produced by the Edinburgh UNESCO City of Literature. You may recall we kick-started things a tad early with a flashmob for Robert Burns on his birthday, when we were joined by a crowd of people to sing ‘A Man’s a Man’ outside St Giles Cathedral on Tuesday 25 January. We asked the Let’s Get Lyrical team to come on board as we felt a spot of communal Burns singing was a perfect taster for what Let’s Get Lyrical had in store, and it seemed the almost one hundred strong crowd that joined us agreed. 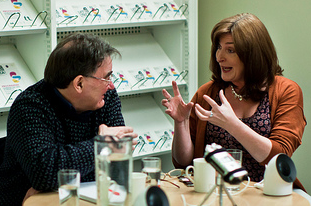 You can see footage of the event from Guardian Edinburgh here. Next up, on Thursday 3 February, we welcomed Janice Galloway and Simon Frith to the library for a closer look at Art Song, that traditional marriage between music and verse. You can read an account of this fascinating discussion, and listen to a little audio from it, on the Let’s Get Lyrical website. On Saturday 19 February, drenched in croissants and coffee and sunlight streaming in through our window, our Ryan in Residence took a group on a journey through the poetry of the songwriters in Nothing But … the Songwriters’ Cut. They looked at the work of Leonard Cohen, Paul McCartney, Bob Dylan (you can borrow these titles from us! ), and pondered the musings of Derek Mahon ‘once upon a time this stuff was sung, not spoken’ versus the wisdom of Leontia Flynn: ‘You can’t dance to poetry’. One participant called the session ‘a great’ start to the weekend’. Hurrah! 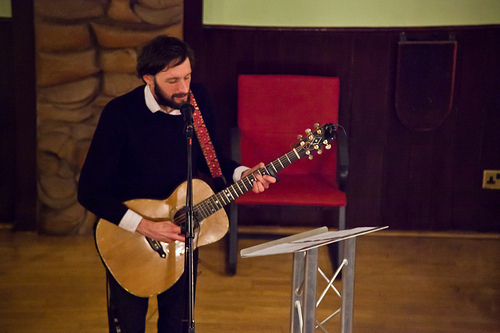 Poet Robin Robertson and singer songwriter Alasdair Roberts first collaborated together on Chemikal Underground’s ground-breaking Ballads of the Book album in 2007 for the track ‘The Leaving’. They have continued to collaborate together but had never shared a stage: having wanted to stage this event for a long time, Let’s Get Lyrical provided the perfect opportunity. And so it was we took to the gorgeous Georgian aesthetic of St Mark’s Unitarian Church on Friday 25th for en evening of folk and folklore, of poetry and music jigsawed together by two wonderful performers. If you couldn’t join us, you can recapture some of this very special evening, in audio and pictures, on the Let’s Get Lyrical website. 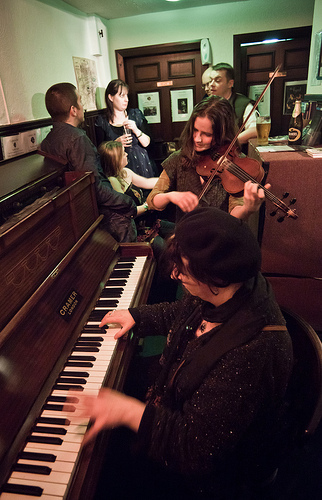 And finally, on Saturday 26 February, we launched ourselves upon the traditional music crowd at Captain’s Bar for a party! We had poems, guitars, fiddles, pianos, sea shanties, ditties, traditional folk music, ‘Stormy Weather’, ‘Cry Me A River’, ‘Mona Lisa’, ‘American Pie’ and an unmentionable song about the effects of Guinness, topped off by Tony’s great Guinness Disappearing Trick. There are photos here! If you managed along to any of our events, or others as part of the campaign, or got lyrical in other ways – by submitting your story, following along on Twitter or Facebook, listening to the podcasts, using the educational resources, enjoying the feature stories and interviews on the website – then the City of Literature team would love to have your feedback – their survey only takes 4 minutes to complete. This is how it was for us, but in the words of James, how was it for you?